There is more to Halloween than you might think. Yes, it’s about monsters and ghouls, and the fear of the unseen. Do not let Halloween ‘trick” you though. Halloween is also the season of charity and feeding the hungry. Where I live in Cincinnati is an old ghost legend at a cemetery near the Ohio River. A mysterious light would shine from this graveyard at night along with the eerie tune of a fiddler. No one dared to check it out. A professor from the nearby College of Mount St. Joseph, Cecil Hale, did some “digging” and found out this “ghost” first appeared at the time of the Underground Railroad. This was the secret network which guided slaves to freedom in the north before the Civil War. The strange light was likely a signal meant to guide slaves across the Ohio River. The creation of a ghost was meant to keep people away from the cemetery. This scary story was actually a cover for the most noble act of charity, giving the oppressed a light to freedom. This meant sending them to their next safe house on the Underground Railroad. The travelers on this Railroad were hungry and these stops along the route gave them food and renewed their strength to keep going. 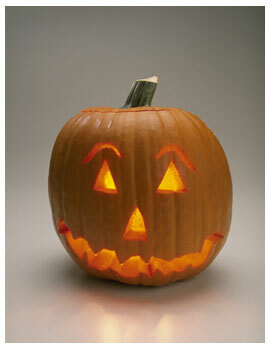 Today, the ghosts and creatures of Halloween are huge business, with billions spent yearly on candy and costumes. The amount spent each year on Halloween could finance hunger relief missions in many countries around the world. Since 1950, Halloween has added an extra surprise for those receiving trick or treaters. Many thousands of children have appeared at the door with a Halloween bag, not just for candy, but one to collect change for UNICEF. It all started when the Reverend Clyde Allison and his wife Mary Emma had an idea to turn Halloween into a night of charity. Since that time more than 170 million dollars has been raised for UNICEF and its operations providing food, medicine and education to children in impoverished countries. Trick-or-Treat for UNICEF is a Halloween tradition that saves lives. Think about this. On Halloween night you could collect donations to feed starving children in Syria, South Sudan, Mali, Afghanistan, Yemen, Democratic Republic of the Congo and other countries suffering from war. Small children die every day because they cannot get the nutrition they need. UNICEF uses a miracle food called Plumpy’Nut to save their lives, but only if they have enough supply. Funding is often low for humanitarian aid missions because it’s not made a high enough priority. That is where individuals can take the lead and the responsibility. There is even now chocolate and vanilla flavored bars you can purchase that lead to donations for Plumpy’Nut. The company This Bar Saves Lives makes a donation for each bar sold so Save the Children can distribute more Plumpy’Nut. So on this Halloween night, you can make a change. You can experience the other side of Halloween, the one of charity. The College of Mount St. Joseph is hosting trick or treat events as well. Yes, there will be ghost stories, but also a canned good collection for the local Delhi Food Pantry. The school’s Campus Ministry, Student Nurses Association and the Activities Board are all pitching in to collect the donations. It turns out this Halloween food drive is extra timely as food stamps are being reduced in the United States. The strain on food pantries is going to be enormous. The coming scare for America is going to be a further escalation of hunger in an already suffering economy. Things are not always what they appear to be. Sometimes though you decide what something is to be. Your actions make the difference. Your ideas can give power to charity. On Halloween you can add an extra surprise to this “fright night,” making it a special event that helps the world.